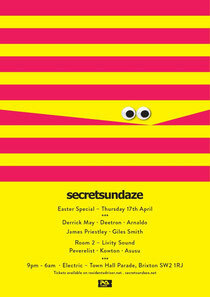 secretsundaze recently announced their first party of their 13th season in London, at Electric, Brixton on Easter Thursday. After sell out shows there with Nina Kraviz last Spring and Levon Vincent this NYE, they return with a mix of old and new skool DJs that should please both house and techno fans alike. Headlining the event is Derrick May, Detroit innovator and famously part of the Belleville 3 alongside Juan Atkins and Kevin Saunderson. Spanning a career of decades and responsible for various classic productions along the way, Derrick is now most renowned for his prowess as a DJ and is a man still very much at the top of his game. Co-headlining is Swiss veteran Deetron, whose skills as both a producer and as a three-turntable DJ, has possibly earned him a unique position in the world of house and techno, fiercely independent, and not aligned to any particular crew or label. These skills can be heard on his Balance CD compilation and most recently his natural flair in the studio 'Music Over Matter', his second artist album. Third guest in the main room is Argentinian, but London based, Arnaldo, who has steadily been carving a reputation as one of a new wave of serious deep house artists emerging from the city. Playing only the coolest spots and often publishing his long live sets online to much acclaim from the heads, he is also more than handy in the studio, recording for esteemed labels such as Lawrence'sSmallvilleand Blank Slate. 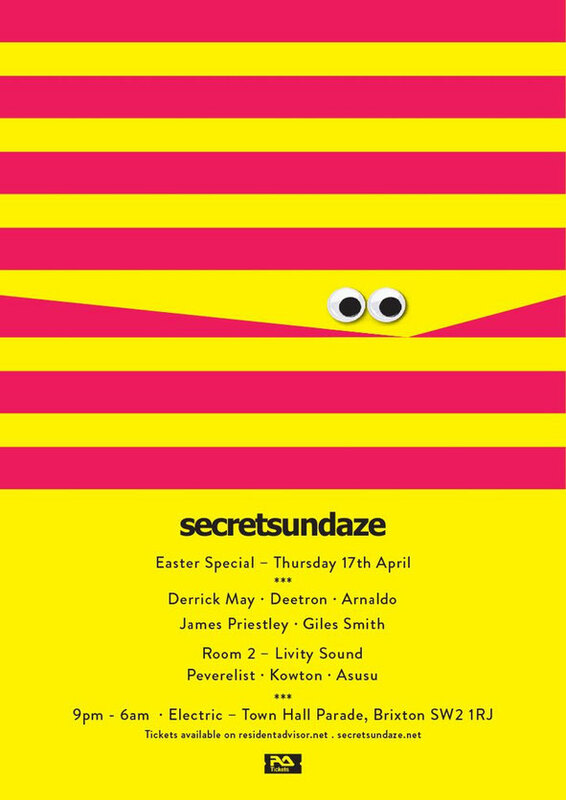 secretsundaze founders James Priestley and Giles Smith will be on residential duties, warming up and rounding off proceedings. Taking over Room 2 is Bristol based Livity Sound. The union of artists Peverelist, Kowton & Asusu is releasing possibly some of the most forward thinking music out there, taking inspiration from dub, jungle and crucially techno. They are at the forefront of a new wave of UK labels exploring these crossroads. The results are formidable, rightfully earning them the highly respected accolade of Top Label of 2013 on Resident Advisor.